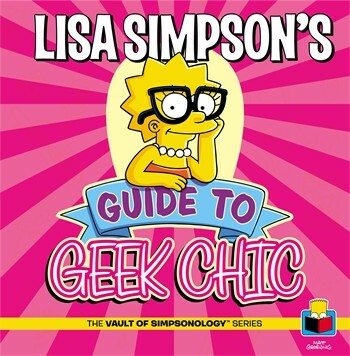 Lisa Simpson's Guide to Geek Chic is the fourth book in the series of Vault of Simpsonology. It was released on March 17, 2015. "In Lisa Simpson's Guide to Geek Chic, Springfield's most sensitive student reveals the secrets of being a misunderstood geek goddess. The geeks have inherited the earth . . . And Springfield's most outspoken and overlooked middle child, Lisa Simpson, is here to tell you why! So what does it matter that you don't run with the popular crowd? You control the trends and tastes of popular culture. Who cares if you aren't part of a clique? Your idiosyncratic style is now très chic. So what if you're not very social? You're tech savvy drives all social media. There's no need to lay low in nerd anonymity. You are the smartest person in the room, and it's time to fulfill your dork destiny!" What is your Jazz Name? Modified on January 14, 2018, at 16:50.